So long summer! 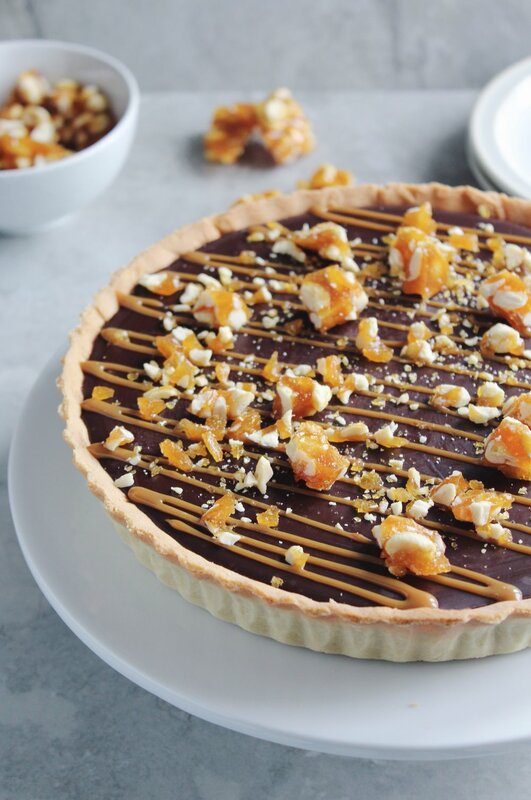 I’m diving straight into the autumn months ahead with this decadent chocolate ganache tart, filled with a smooth, velvety caramel and topped with a crunchy, nutty brittle, which almost got devoured before it made it onto the top! September is my favourite month of the year. I might be a little bit biased, because September is also my birthday month (yay) - but birthday fun aside; I think September presents the perfect opportunity for a mini new year. I guess this mentality stems from my childhood, where September meant back to school, and although I always dreaded the end of the summer holidays, September signified a fresh start. The thought of new school shoes, a backpack, and a crisp new pencil case was enough to ease the pain! September still has this effect on me, even years after I last stepped foot inside a classroom (shudders). We tend to relax and wind down a bit over the summer months, summer holidays take precedence over work and it’s generally a time to catch up and recharge. Come September, everyone fires into action again and - dare I say it - the homestretch to Christmas starts. This recipe is definitely one for die-hard chocolate fans - namely, my boyfriend. It’s dangerously rich and the kind of tart that you’d ask for just a slither of, but would ultimately find yourself going in for seconds... thirds might be pushing it though!